Today has been a full on festival of fun, food and fast coasters, and today we really have seen it all – sometimes twice!! Welcome to this initial report on the progress being made by our young people as they develop their four capacities and six R’s within the structure of the framework provided by the Preston Lodge High School “Aims & Values”. 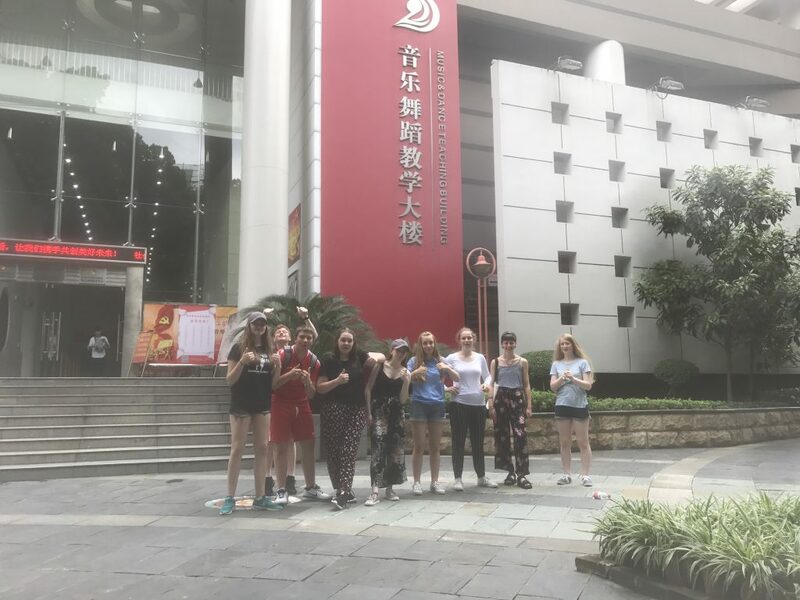 This is a short reflective analysis of the impact of this experience and the opportunities provided through full participation in all of the learning tasks which have been planned by the highly trained staff and of course by completing the pack of graded worksheets. We of course intended to complete several of these reflections over the duration of the sequence of planned teaching and learning episodes which will form a significant component of our Self Evaluation. We will have online questionnaires, focus groups, planned observations and lots of colouring in with highlighters. Did we also say that the kids are fine? Well, yes, we think so. We’ll do a ‘headcount’ tomorrow morning to make sure. Tuesday 29 May at 6.30pm in the School Assembly Hall. Please bring your child’s EHIC card. (Further information sent via Google classroom). Meetings will be held in the assembly hall on Thursday 8th March at break time and again at lunch time. Come along for a presentation on next year’s ski trip, and to receive an information letter. The ski trip is open to all students, regardless of ski experience or ability. If you can’t make either of the meetings, and are interested in this trip, then please see Mr Kidd or Mr Thomas for more information. This is an amazing thing to watch. 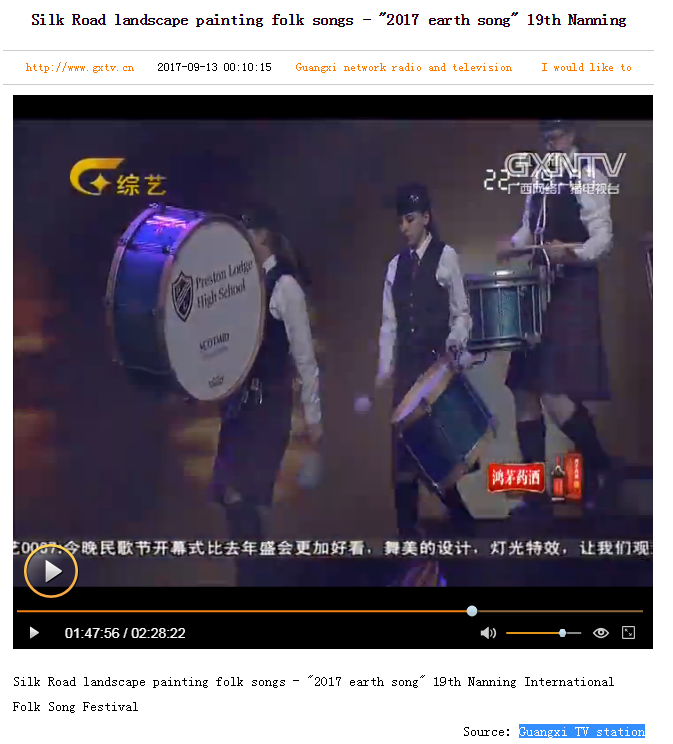 The Preston Lodge High School Pipe Band at the 19th Nanning International Folk Song Festival. 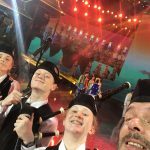 You should watch the first few minutes to get a sense of the magnitude of this event, a stadium audience of around 50000 and a massive TV audience – Scotmid are getting their monies worth from the sponsorship message on the bass drum!! 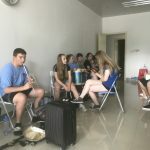 Monday was to be a busy day rehearsing for the opening gala concert but we had some free time in the morning so visited the Quangxi Arts Institute which would be the equivalent of the Royal Conservatoire in Glasgow. 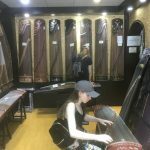 There were many music shops in the area and we visited the biggest one. 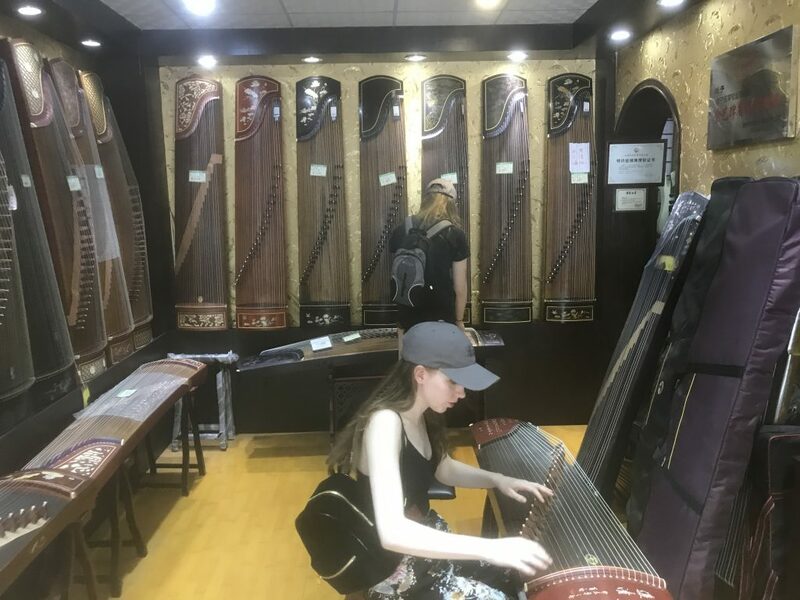 The staff were incredibly helpful and demonstrated and allowed us to try a wide variety of traditional Chinese instruments. 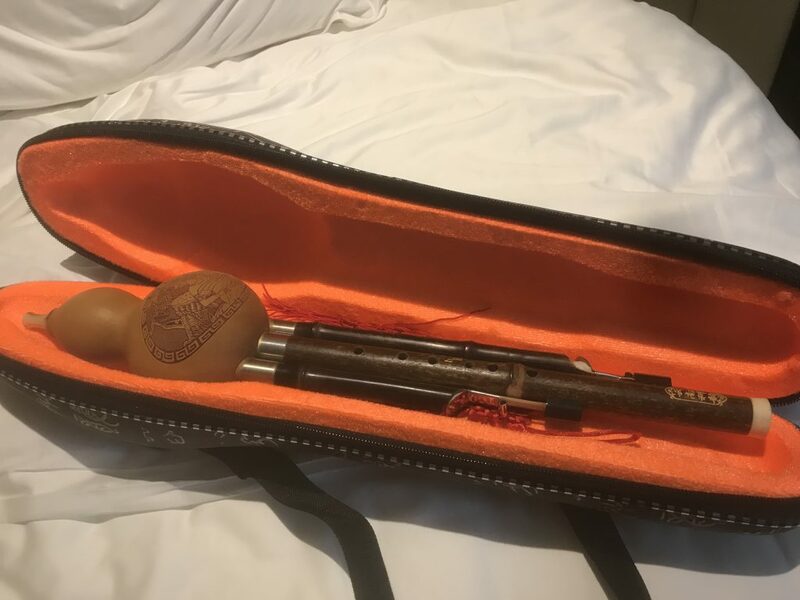 Lee bought a Hulusi flute which has similarities to the bagpipes in that it is a reeded instrument with a chanter and two drones. 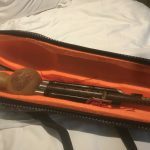 It is also in the same key as the bagpipes so perhaps we will be able to combine the two instruments in the future. 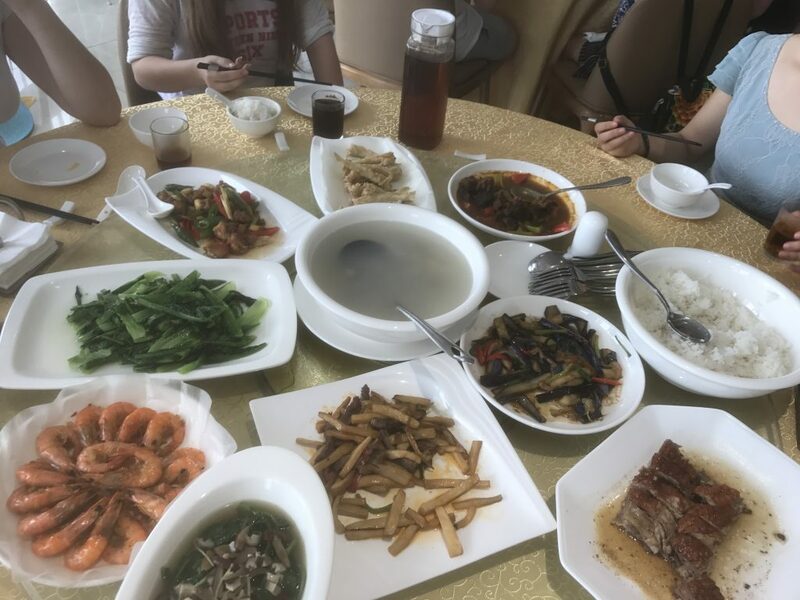 Lunch was a challenging affair with a variety of pretty unusual delicacies. 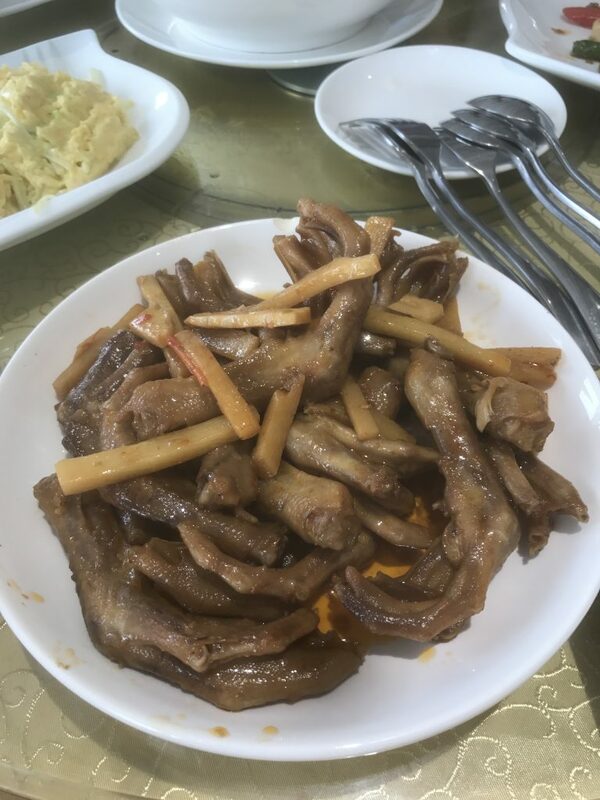 Ducks feet were the order of the day and though a few of us tried to give it a go, in the end none of us had the stomach for it. 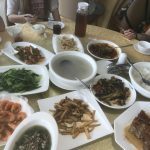 Our interpreter, Kimi, spent some time with us teaching us how to say our “Chinese” names with sometimes hilarious outcomes. In the end she awarded us all 90 – 100%. The rest of the day was spent rehearsing for the show. The press were out in force and we gave interviews for various television stations throughout Asia. 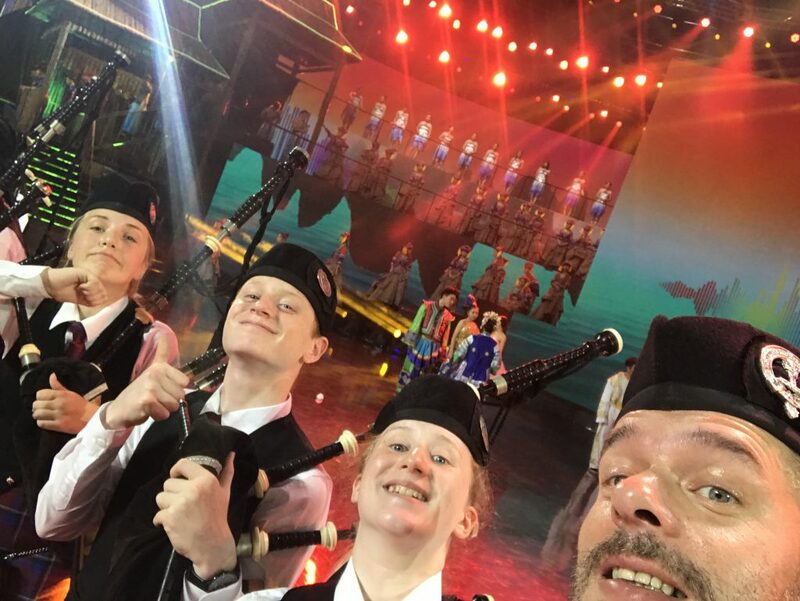 We were also in serious demand for photos and I’m sure by now the entire cast has had a selfie taken with at least one of us. The day finished quite late and we did not get back to our hotel until 12.30am. It’s showtime tomorrow so everyone will hopefully get a good nights sleep. 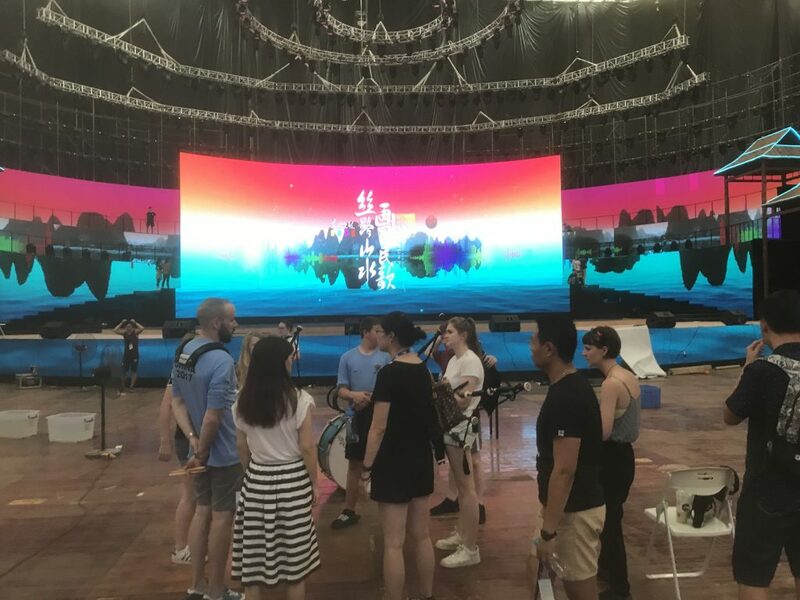 Sunday was supposed to be a day of rest for us but the musical director of the opening concert decided to call another rehearsal in the evening. With the concert being such a large scale production and viewed live by millions on television they were leaving nothing to chance. 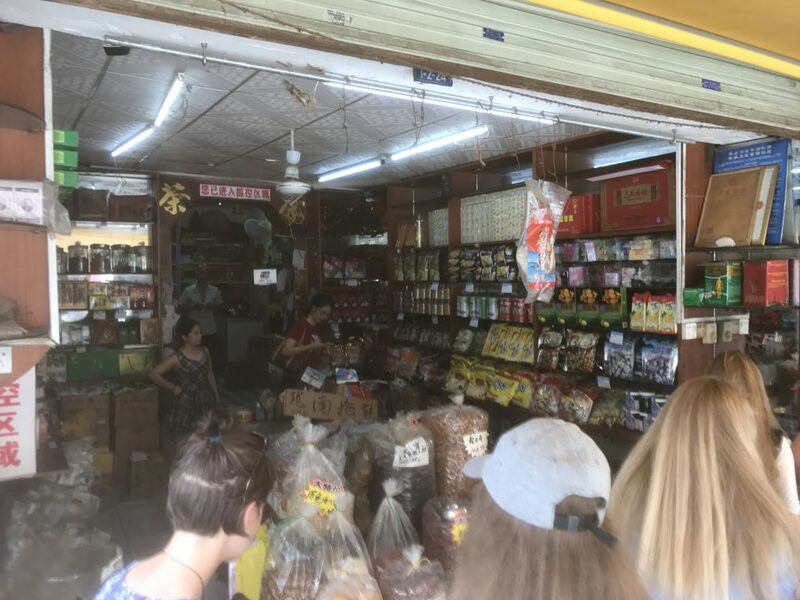 We still had most of the day free so our guides took us to a traditional Chinese spice market. 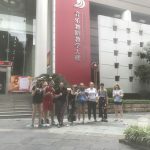 We took the metro, which has been a new addition since our first visit to Nanning in 2013, which was very busy but quite comfortable with air conditioning. 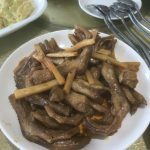 The area where the market was located was in a much less developed area of the city which gave us a good feel for what ‘old’ Nanning would have been like. The market was very busy and the sounds and smells were an assault on the senses. 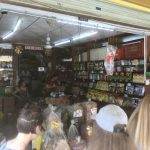 We sampled a variety of Chinese herbs, dried fruits and roots, and tea, and bought some things to take home. We then visited a traditional clothes market which was a multi storey building with small stalls inside. Each floor was dedicated to a particular item. One entire floor of shops selling suitcases and bags, another completely dedicated to underwear, another for men’s clothes and another for lady’s clothes. 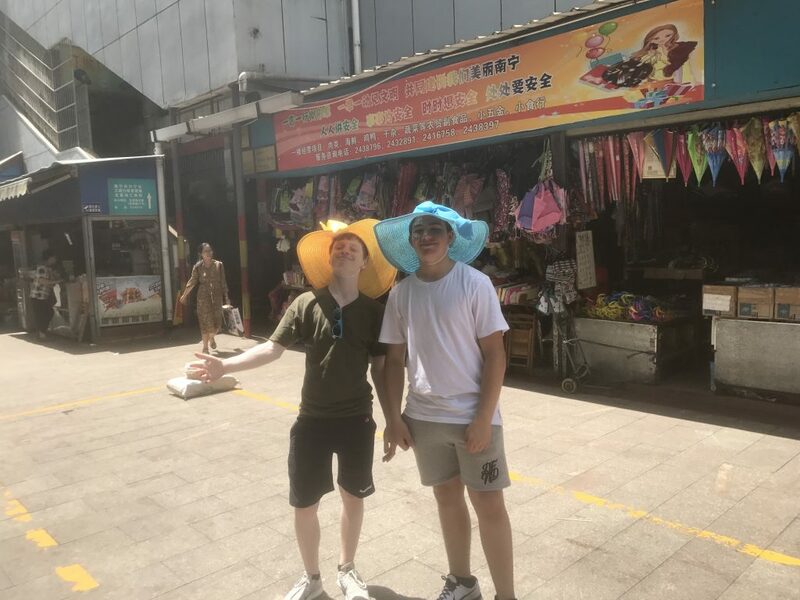 There was even a street with 4 or 5 shops beside each other selling umbrellas. 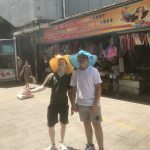 This gave us a good opportunity to test our haggling skills as if you weren’t getting an item for the price you wanted you simply moved to the next shop and continued until you got it for the price you wanted. Competition for our custom was fierce amongst the traders and we all came away with some serious bargains, with the possible exception of the hats that Josh and Blair bought. After dinner we were taken to the stadium for more rehearsals. 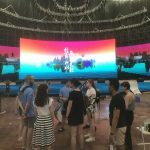 The rehearsal was a very long drawn out affair but it gave us a good opportunity to see some of the other acts rehearsing, and also mix and have fun with many of the other artists backstage. 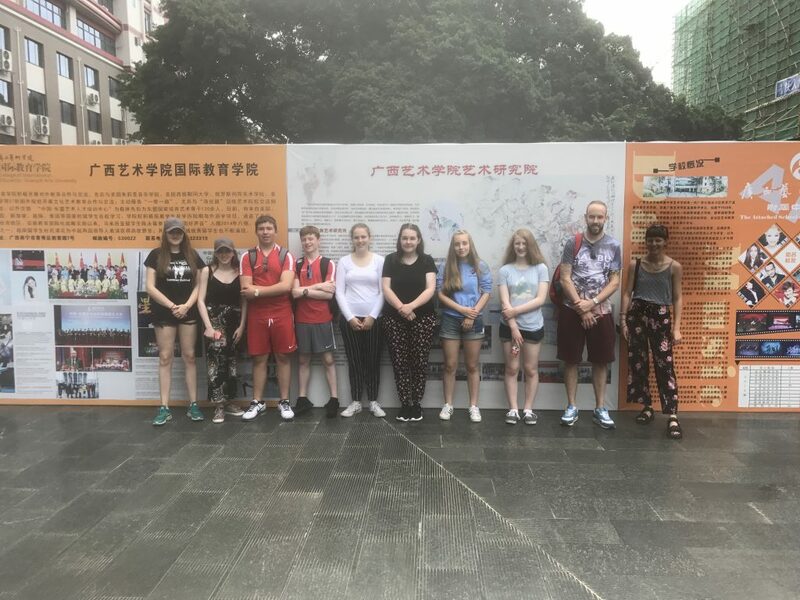 Everyone is really enjoying themselves and coping admirably with the intense heat and humidity. 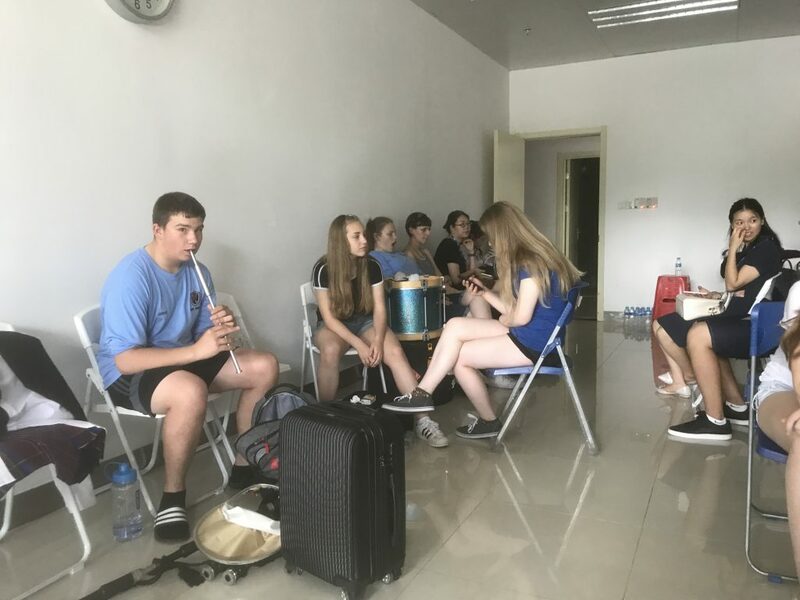 We were allowed to have a fairly relaxed morning after the busy day yesterday and were picked up at 11.30am and taken to the Guangxi Sports Stadium which is the venue of the International Arts Festival of Folk Songs Opening Concert which we are to be part of. 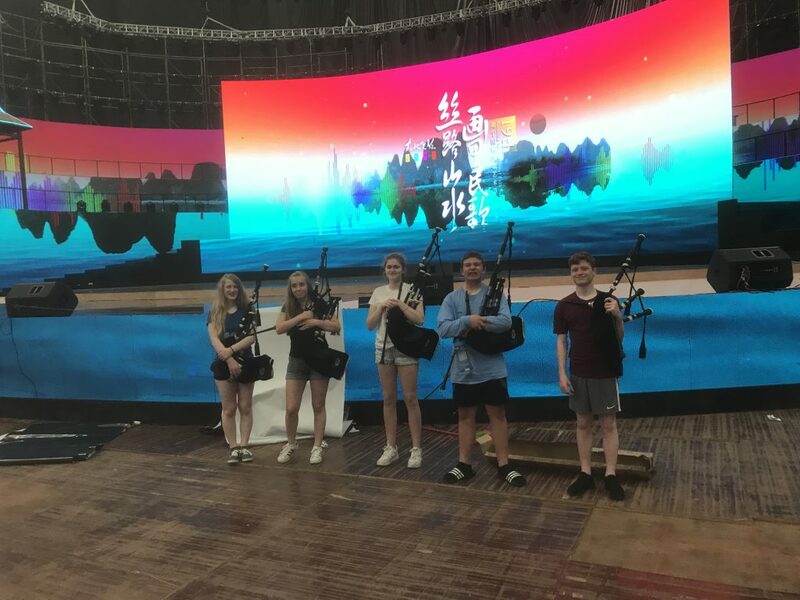 We are performing a piece of music called “Song across the Land” which is a culturally diverse piece of music, including Chinese music, singing in the Zhuang minority language, Malaysian singing, and of course the bagpipes with Scotland the Brave included. This piece is to be the finale of the concert. 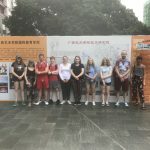 It was explained to us that professional musicians from all over the world have performed at the festival many times but very few have ever taken part in the opening concert, and never before have they had a school group from outside Asia performing, so for us to be involved is indeed quite a coup. 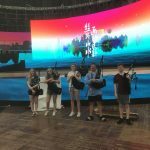 We started the afternoon by recording what we were to play for their backing track for the concert, because although we would be playing live on the night it was going to make the sound engineer’s job easier to have a pre-recorded mix coming through. Nothing is left to chance here and the sheer scale of the production is very impressive. After dinner in our hotel we were again back to the stadium that night for more rehearsals. We should all sleep well tonight.